Last night CNN en Español aired the above image, which captions at the bottom "Who Killed him?" by "accident". The image of President Chavez with the caption about killing him below, which some could say subliminally incites to assassination, was a "production error" mistakenly made in the CNN en Español newsroom. The news anchor had been narrarating a story about the situation between Colombia and Venezuela and then switched to a story about an unsolved homicide but - oops - someone forgot to change the screen image and President Chavez was left with the killing statement below. Today they apologized and admitted it was a rather "unfortunate" and "regrettable" mistake. Yes, it was. On a scarier note, an internal CIA memorandum has been obtained by Venezuelan counterintelligence from the US Embassy in Caracas that reveals a very sinister - almost fantastical, were it not true - plan to destabilize Venezuela during the coming days. The plan, titled "OPERATION PLIERS" was authored by CIA Officer Michael Middleton Steere and was addressed to CIA Director General Michael Hayden in Washington. Steere is stationed at the US Embassy in Caracas under the guise of a Regional Affairs Officer. The internal memorandum, dated November 20, 2007, references the "Advances of the Final Stage of Operation Pliers", and confirms that the operation is coordinated by the team of Human Intelligence (HUMINT) in Venezuela. The memo summarizes the different scenarios that the CIA has been working on in Venezuela for the upcoming referendum vote on December 2nd. The Electoral Scenario, as it's phrased, confirms that the voting tendencies will not change substantially before Sunday, December 2nd, and that the SI (YES) vote in favor of the constitutional reform has an advantage of about 10-13 points over the NO vote. The CIA estimates abstention around 60% and states in the memo that this voting tendency is irreversible before the elections. Officer Steere emphasizes the importance and success of the public relations and propaganda campaign that the CIA has been funding with more than $8 million during the past month - funds that the CIA confirms are transfered through the USAID contracted company, Development Alternatives, Inc., which set up operations in June 2002 to run the USAID Office for Transition Initiatives that funds and advises opposition NGOs and political parties in Venezuela. The CIA memo specifically refers to these propaganda initiatives as "psychological operations" (PSYOPS), that include contracting polling companies to create fraudulent polls that show the NO vote with an advantage over the SI vote, which is false. The CIA also confirms in the memo that it is working with international press agencies to distort the data and information about the referendum, and that it coordinates in Venezuela with a team of journalists and media organized and directed by the President of Globovision, Alberto Federico Ravell. CIA Officer Michael Steere recommends to General Michael Hayden two different strategies to work simultaneously: Impede the referendum and refuse to recognize the results once the SI vote wins. Though these strategies appear contradictory, Steere claims that they must be implemented together precisely to encourage activities that aim toward impeding the referendum and at the same time prepare the conditions for a rejection of the results. *Seek an aliance between those abstentionists and those who will vote "NO"
Operation Tenaza has the objective of encouraging an armed insurrection in Venezuela against the government of President Chavez that will justify an intervention of US forces, stationed on the military bases nearby in Curacao and Colombia. The Operation mentions two countries in code: as Blue and Green. These refer to Curacao and Colombia, where the US has operative, active and equipped bases that have been reinforced over the past year and a half in anticipation of a conflict with Venezuela. The document confirms that psychological operations are the CIA's best and most effective weapon to date against Venezuela, and it will continue its efforts to influence international public opinion regarding President Chavez and the situation in the country. Operation Tenaza is a very alarming plan that aims to destabilize Venezuela and overthrow (again) its legitimate and democratic (and very popularly support) president. The plan will fail, primarily because it has been discovered, but it must be denounced around the world as an unacceptable violation of Venezuela's sovereignty. The original document in English will be available in the public sphere soon for viewing and authenticating purposes. And it also contains more information than has been revealed here. Venezuela is just rockin' these days!! The Third Annual International Circus Festival is kicking off this week in Caracas, and folks can enjoy circus entertainment from Argentina, Spain, Brazil, Chile, the United Kingdom and France through Monday, December 3rd. There will be street performances, acrobatics, theatrical events, music and artistic expressions all over town. Who said we couldn't have fun during the referendum campaign? In the meantime, the state of Zulia, where the opposition passion runs high, is hosting the First Annual Festival of the Earth, where lovers and artists of clay and rock are coming together to create brilliant earthy artworks. Caracas is also hosting the annual Festival of Artesans in Parque del Este, which I hope to visit tomorrow in order to find some unusual local handmade Christmas presents for my family and friends! But oh, let us not forget the crazy violent opposition that today actually killed an innocent 19-year old worker from PetroCasa, a government company that builds affordable housing for low income families in Venezuela. Yes, that unfortunate event occured this very morning in the State of Carabobo after the opposition decided to launch a series of violent "guarimbas" in the streets across the nation as part of what their extremist faction has named "the march with no return". Well, we hope they will never return with all their violence and destabilization. Actually, in Caracas, this "guarimba with no return" had little affect. Just a few private university students blocked traffic in the late morning hours, but were quickly (and peacefully) dispersed by authorities. However, in the states of Carabobo and Aragua, the groups got violent, and at least 80 were arrested by security forces. The assassin of the the 19-year old has been detained, identified and will be charged with murder. We do have a legal system and a state of justice here, despite what the opposition thinks. But the oppositional media showed and said nothing. They only seem to care when the one who is hurt or killed is from the middle or upper classes. Event the international media, like CNN en Español, which has religiously covered the opposition student marches all month, aired nothing about the tragic incident. So much for media objectivity. This Sunday is the referendum vote on the Constitutional reform. The "SI" to approve Chavez's proposal will most likely win by a clear margin, but the opposition will not cease its tactics. They will probably increase their violent actions over the next few days and after the referendum is won in order to prevent the Chavez government from implementing the new laws and regulations that will bring social and economic justice, and power, to the people. The Colombia situation is deteriorating by the minute. Now, relations between Venezuela and Colombia are frozen because President Uribe of Colombia cut off President Chavez's mediation efforts (which Uribe had originally approved), because of a very short telephone conversation held between Senator Piedad Cordoba from Colomba, who is the main mediator in the humanitarian peace process in Colombia, President Chavez, and the head of Colombia's armed forces, during which the discussion was about the detained members of the FARC. Chavez says the conversation was necessary and authorized by Uribe, since Chavez was charged with negotiating between the FARC and the Colombian Army that is holding members of the guerrilla group as prisoners. 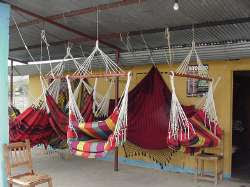 But Uribe claims the conversation violated the terms of the mediation efforts and therefore, not only did he terminate Chavez's role, but also Senator Cordoba's efforts, which date back months, if not years, and include several assassination attempts against her by right wing Colombian forces. And, to top it all off, the Colombian government is now charging the Senator with "betraying her country", and the government of France has offered her political asylum. So, she risked her life to bring peace to her country, with the authorization of her government, and now she is a traitor???? This situation between Colombia and Venezuela plays right into the hands of the United States government, which has been searching for a reason to create a conflict between the two neighbor nations in order to justify an international intervention. Lets hope things don't get any worse. Just four days left of campaigning and tensions are running high. Be on the lookout for massive media manipulation and wacky opposition tactics to deceive and distort the mere reality on the ground here that gives every indication of a strong "SI" in favor of the reform this coming Sunday. We just culminated the III Annual International Book Fair here in Caracas, sponsored by the Ministry of Culture and the National Book Center. This year's theme was "Is Revolution Possible in the United States?" and authors and long term activists such as Ward Churchill, Kathleen Cleaver, Amiri Baraka, Amina Baraka, amongst other important voices, gathered together for a week engaging in this very intriguing debate with the people of Venezuela. The event was extremely informative, inspiring and successful and led to the final determination that YES! 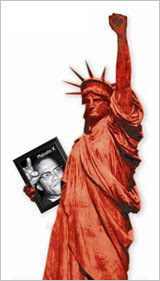 revolution is possible in the USA, but it certainly needs a major push and some massive stimulation!!!!! 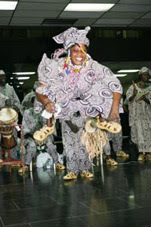 The Second Annual Festival with the Peoples of Africa is also taking place right now in Caracas. Cultural and political representatives from the Congo, Namibia, Benin and other African nations are meeting with high level members of the Venezuelan government and sharing cultural traditions with the people of Venezuela. These initiatives are part of the Chavez Government's foreign policy based on cooperation and integration with other people's around the world that share similar characteristics with Venezuela: poverty, rich natural resources, colonized past, developing status, immense potential for social and economic development. In the meantime....the violent opposition students and political leaders are still trying to wreck havoc in the streets. 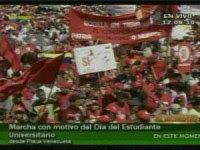 Today is National Student Day in Venezuela and the streets are full of marches from all sides. We are expecting President Chavez to arrive in a few hours to address the crowd of tens of thousands of students that support the Bolivarian Revolution and the Constitutional Reform that will be voted on next December 2nd. This week has been pretty active in Venezuela, to say the least!! On the ground, things are heating up with the campaign for the referendum on the constitutional reform, which will take place on December 2, 2007. The pro-reform folks are the "SI" (YES) block and the anti-reform and opposition folks are "NO" this time around. On Sunday, we had a major march in favor of the reform. There were tens of thousands of pro-reform supporters in the streets of Caracas that marched 7 miles from Parque del Este to Avenida Bolivar to hear President Chavez speak. Most international media didn't report on that, but rather has spent its time reporting on the minor opposition student protests that continue to destabilize and provoke violence throughout the nation. Today, Wednesday, November 7, there was an opposition student march to the Supreme Court in Caracas to symbolically hand over a document protesting the constitutional reform as unconstitutional to the members of Venezuela's highest court. The students marched relatively peacefully throughout the center of Caracas and a small commission of students entered the Supreme Court, were received by the judges and even had a chance to read a statement before the high court members that was broadcast live on national television. This event went without any violent incidents, unlike last week's opposition student march to the National Elections Council (CNE) that resulted in students trying to illegally chain themselves to the staircase inside the CNE headquarters. That incident did end in some violence and obvious reaction from state security forces, though no major injuries occurred. After the march to the Supreme Court (TSJ), the oppositional students returned to the Central University of Venezuela (UCV) and proceeded to kidnap a group of approximately 60 pro-reform and pro-Chavez students, including Libertad Velasco, one of the more well known leaders of the revolutionary student movement. Since public universities have autonomy over their security, state security forces were not able to enter immediately to resolve the situation and rescue the hostages. Private media, such as Globovision, reported that there was an "irregular situation" at the UCV, and later showed images of what they termed "pro-Chavez" supporters armed and firing at the oppositional students. What they did not tell their viewers was that those oppositional students had kidnapped a group of about 60 pro-Chavez students inside the Social Work school of the UCV and the "armed" individuals that entered the ground were members of Venezuela's Civil Protection unit, that entered the UCV after almost an hour had passed, to rescue the hostages. 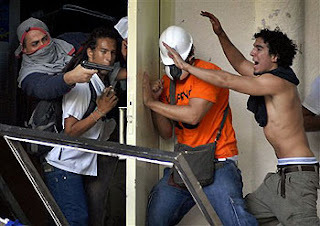 Images broadcast later on national television clearly show the hostages running out of the building on the UCV campus once rescued by the Civil Protection officers. Gunshots were fired up into the air to ward off the violent kidnappers, not to injure them in any way. Unfortunately, in the confrontations before the Civil Protection officers were able to enter the UCV grounds, 9 students were injured, one critically. 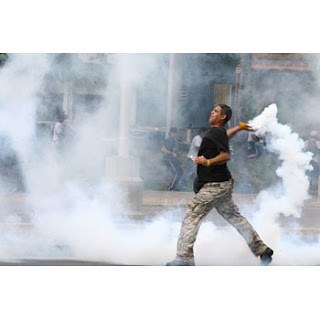 International media and wire services, such as Associated Press, published this photograph: and claimed that government forces are repressing students in Venezuela. Take it from someone on the ground who is closely monitoring all events: The Venezuelan government is doing everything in its power to allow these students to freely enjoy their rights to protest without permitting them to destabilize the country, create chaos, and place in danger the lives of citizens. These types of protests that these students freely enjoy in Venezuela would NEVER, I repeat, NEVER be permitted in the United States. There is just no way the US Government or any city, state or county's police force would permit students to take the streets and public spaces almost daily, throwing molotov cocktails and bottles, as well as other debris, at the police, while damaging public property. In the US, thousands of them would be jailed and subjected to severe repression. Venezuela, on the other hand, is overly permissive with these protests and despite the ample freedom enjoyed by all sectors in this country, the international media distorts the scenario and attempts to paint a portrayal of the Venezuelan government as repressive. Repressive is the US government, permissive is the Venezuelan. Stay alert to the media manipulation and the growing threat of a "colored revolution" (termed the "Marigold Revolution") in Venezuela (like Ukraine, Serbia, Georgia, etc).